There is much to be said for attending the upcoming Client Conference in Scottsdale, Arizona! During this powerful two day user conference, you will learn the latest and greatest features, enhancements, techniques and strategies in using e-Quantum software. There is no better way to learn than by first-hand experiences! This year, the conference sessions are divided into two tracks and include important topics for everyone in your organization from owners to sales reps to accounting personnel and beyond. You'll notice only two tracks are included in this year's client conference and that is because we had an abundance of new and exciting features in the e-Quantum and Quantum Net track that we wanted to focus on these topics! A variety of sessions are detailed below to peak your interest. It's been more than a decade since our Q-Design variable print module was first released and it's time for a makeover! We will explore the brand-new user interface, recently updated to provide your users with a more streamlined and integrated ordering experience in the newest PCI-compatible Quantum Net catalogs. With a modern page layout and a more intuitive process for uploading and selecting images, we know you will consider it a dramatic improvement over the original look and feel. Then, join us as we reveal the long-awaited, completely redesigned Q-Design editor. Q-Design is finally cross-browser compatible, allows you to set up multiple design users without issuing them access to the entire distributor setup area, and the fresh new interface rivals the experience of modern standalone graphics design programs. Join us in this session to check out the most exciting and important Q-Design developments in years! Goldmine and e-Quantum... So Happy Together! Learn how Specialized Office Systems, Inc. used the e-Quantum/Goldmine interface to totally redesign their business practices. Nathan Goldberg, President of Specialized will walk you through some of the amazing things they have been able to do with this powerful interface and the experts at First Direct Inc. Everything from creating workflows for graphics projects to quotes and orders for promotional products and apparel orders to providing contact and order history data in real time through mobile solutions (or paper based for the old school sales reps) to using predictive call routing - getting customers to the person they "most likely" need to speak with. This session will create an entirely new space of possibilities for your company to be more organized, more productive and more profitable, while providing key insight to management. The NEW Distributor Setup where all Q-Net configurations are made has been enhanced and is easier to navigate! Attend this session to see the new client look-up, site options have been re-organized into sections, the Sub Category setup has been combined into the Collapsible Setup, two new Q-Design configurations have been added allowing label changes and alert prompts, new format for customizing color options to include a color palette and a new section for the ship information and view cart has been added to Site Appearance. Plus, nearly every label, button, symbol or alert on Q-Net can now be customized. Attend this session and learn how to navigate the new and improved Distributor Setup. Distributor Setup is a maze of wonderful treasures to assist you with using Quantum Net. Need a clue for how to get started? Attend this session to discover which common requests from distributors can be managed right within your own setup options. Have you ever wondered if you can copy site graphics between clients or where to upload your own custom images or extra pages? Did you know that you can bypass the welcome page so your clients go straight to their items? Have you seen all of the ways you can customize the checkout page? The questions we get every day are the things you need to know. Use these simple tips and tricks to delve into your toolbox and tweak your client sites to perfection! Are your Q-Net sites more like the ugly duckling than the beautiful swan? With a little bit of TLC, your e-commerce site can be dramatically transformed! The ultimate goal of any website is to be straightforward and intuitive, so we'll explore how to keep everything user-friendly while splashing on a touch of paint and making it come alive. From simply adding a client's logo to the welcome page, to more complex graphic elements like sliders and item carousels, we'll look at a variety of real, live client Q-Net sites that are pushing the user experience to the next level and delighting customers. We'll also discuss simple options and ideas to make the site more navigable and easy to use. Attend this session to gather a few tricks that will take your fledgling Q-Net site from zero to hero! PayTrace and Authorize.net are your current gateways with PowerPay managing the funds. This Fall, a PayPal Company will be added as your third PCI compliant gateway. PayPal allows you to accept payment methods for all major credit cards, debit cards, PayPal and ApplePay. It leads the market in mobile payments with such customers as Uber, Airbnb, HotelTonight and Hailo. All merchants who accept, process, transmit or store cardholder data should comply with the Payment Card Industry Data Security Standards (PCI DSS). This means your company should be on the newest version of e-Quantum and Q-Net which is certified as PCI Compliant. Many Q-Store clients have requested credit card purchases to be settled instead of authorized online. This means the final charging of the credit card would be processed by Q-Net before it is downloaded into e-Quantum. This enhancement will also be included in the Fall release. Available now is the ability to partially charge a credit card in OE before the client's invoice is created. And the ability to charge the remaining balance in AR without removing the authorization code from the card. Our popular Q-Tips session will cover NEW Time Saving features added to the system. The Q-Net Order Confirmation and Managers Approval Order Status if applicable is now visible when editing a PO or Release, when displaying Order History and during Q-Net Order look-up. A Revision Alert has been added to notify your company of a new e-Quantum and Quantum Net release. This alert is located in User Preference, New Program "Alert Q-Net". When selected, a bubble will appear in the upper right corner of the main e-Quantum screen when new Revision Notes are available for Q-Net and an e-Quantum update is available for download. By double clicking on the bubble, it will take you to the revision notes. Q-Resource has been setup using our Digital Asset Management module. Located in Help, Q-Resource will include documentation, how-to's, recorded training webinars and information to help your company. How to Search for a program or report and once located, the ability to Launch this action. Making sure all expenses are accounted for before invoicing multi-vendor orders can be a complex task. We have added the ability to identify fully expensed PO lines before invoicing the client. Changes in Vendor Maintenance are a NEW check box "Ask if Fully Expensed". During Expensing, the system will now ask about the status of the item. If the item is Fully Expensed and allows you to see estimated expenses from all vendors. This will allow you to use the NEW Invoicing Rule. This rule checks for the fully expensed flag for PO line items with multi vendors, to ensure all expenses are entered before using the Auto Invoice function. The various Auto Invoice Rules including NEW "Invoice entire PO" which can be used for matching Q-Net orders to the invoice will be covered. Learn how Auto Invoicing can save time for your company. Creating Credit memos, Summary Billing and Consolidated Invoices will be discussed. Setting up retention times and data management is critical to small businesses. Explore data purging and archiving. AR, AP and Inventory modules has a tab in File Maintenance to define your company's policy for data retention. Many distributors have had e-Quantum installed for over five years and without properly purging and archiving, your system can be bogged down when performing your daily operations and printing reports. Please note that the Hotel Reservation Deadline is September 11, 2016. The e-Quantum Client Conference is upon us and the hotel reservation deadline is September 11, 2016! This means your registrations need to be made sooner than later! Experience the beauty and hospitality of the Southwest when you stay at Embassy Suites Scottsdale - The Finest of all Scottsdale, Arizona hotels. All of our 312 guest suites are 100% non-smoking and feature a delightful mix of spacious accommodations and signature amenities, offering you the best value in Scottsdale Hotels. American Breakfast daily with fresh fruit, eggs, and more! A dedicated group website has been created for the conference to make your hotel reservation online. Or contact the hotel reservations directly at 800-528-1456 and mention the group code e-Quantum 2016 International Client Conference to receive the negotiated rate. Super Shuttle offers service to and from the Phoenix Sky Harbor International Airport. Reservation required. Add an automatic Bill To note on your orders from Q-Net to "Bill With". 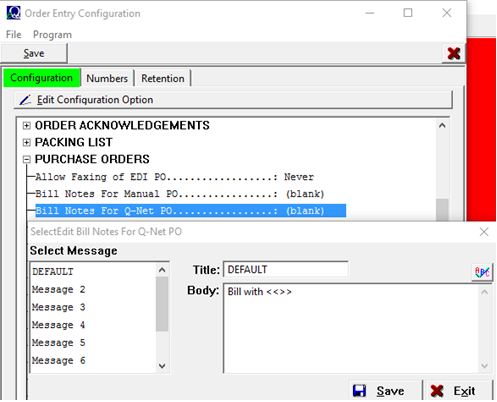 In OE Maintenance>OE Configuration for Releases and Purchase Orders, "Bill Notes for Q-Net" Release and Purchase Order allow you to Note for which PO's and Releases should be billed together for a Q-Net Order. 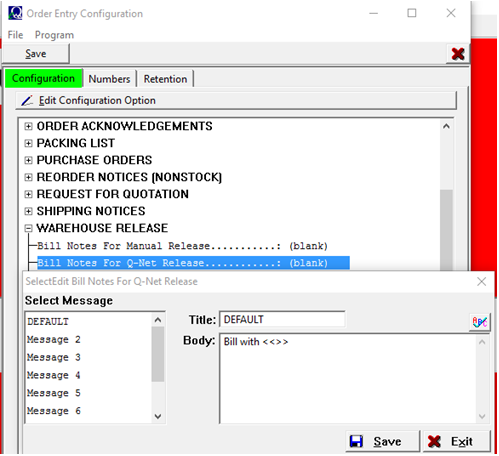 Add "Bill with <<>>" so a Bill Note will appear with the Release and Purchase Order. The Document numbers will appear where the <<|>> are in the Bill Note. Change "Bill With" as needed. Do the same for the Purchase Order. You have a Client Override for both the Release and Purchase Order as well. Click here for documentation or email support@e-quantum.com for assistance with setup. Nathan and Susan Goldberg of Specialized Office Systems in Phoenix, Arizona, proudly welcomed a baby boy into their family, Leo Simon Goldberg, born June 15, 2016. Nathan is one of the leaders in our Independent Industry and Specialized Office Systems is among our most progressive clients. 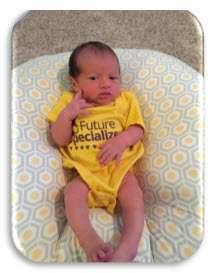 Congratulations to Nathan and Susan, and we'll look forward to seeing Leo at a future client conference.